Press PERFORM to enter Performance mode. Press EDIT. There will be an arrow underneath the number “1” on the mixer display indicating that Zone 1 is currently selected. “Zone Param” will be highlighted by a bullet to the left. Press ENTER. Verify that the screen reads “Z1”, and that “Zone” is set to “On”. Press the down arrow key once to highlight “Tone”. Use the dial or numeric keypad to select Tone P:060 “RetroSynBass”. If you use the numeric keypad, remember to press ENTER after you select the tone number. Press the down arrow once to highlight “KeyRangeLow”. Press the lowest key on the keyboard, which will change the value on the screen to “C2” (if it isn’t set there already). Press the down arrow once more to highlight “KeyRangeHi”. Press the C on the keyboard 2 octaves higher than the lowest key. The screen will show the value as “C4”. You may notice that the bass sound is in a range that is too low to be useful. Press the down arrow 3 times to highlight “Oct. Shift”. Use the dial or press the YES/+ button once to “+1”. The left side of the split, the bass tone, is now ready. Press PART + to edit Zone 2, indicated on the screen as “Z2”. Press the left arrow button 3 times to return to edit page 1/8. “Zone” will be highlighted. Use the dial or YES/+ button to select “On”. 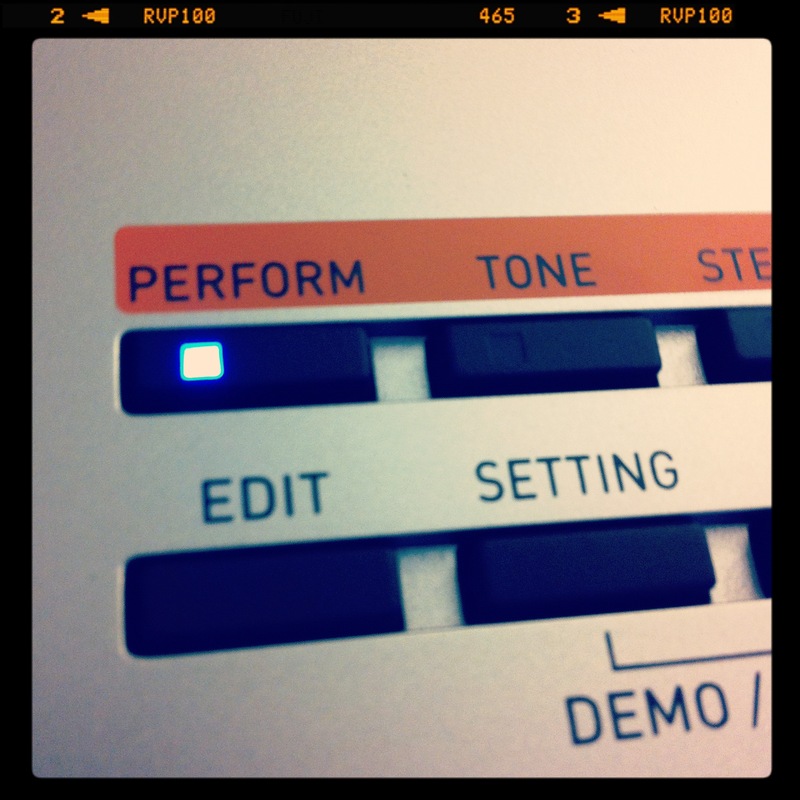 Leave “Tone” set to P:100 “StereoGrPiano” or select the PCM tone of your choice. Use the down arrow to navigate to “KeyRangeLow”. Press the C# 2 octaves up from the lowest. The screen will show the value as “C#4”. Press the down arrow to highlight “KeyRangeHi”. Press the highest key on the keyboard, and the value will change to “C7”. You now have a bass/piano split. Press WRITE, then the down arrow to highlight the name. Use the dial, numeric keypad, or -/+ buttons to change the name of your performance. Press the up arrow to highlight the User memory location. Select a location from U:0-0 to 9-9 (an * denotes a currently occupied program, which you may overwrite if you wish). Press ENTER, followed by YES. Your Performance split is now saved. To make a layered sound, follow the same procedure, but set identical “KeyRangeLow” and “KeyRangeHi” values for both zones. This entry was posted on April 5, 2012 by MikeMartin. It was filed under Performance Mode, Performance Mode, XW Synths, XW-G1, XW-P1 and was tagged with edit, Layer, Performance, Split, XW-G1, XW-P1. I did the split with a bass and piano, but I have problem. When I go to Tone mode it’s set to the bass sound I chose in the split. But if I choose another sound in Tone mode, and then go back to Performance mode, the bass has been changed to the other sound. But I want to be able to try the sounds in Tone mode without them messing with my Performance mode. Where did I go wrong? MIDI Desinger XW is HERE! Live Looping on the XW synths!